Discussion in 'Official News & Announcements' started by Liam, Apr 12, 2019 at 10:08 PM. At long last, the coolest and most awesome Skullgirls character in the entire Skullgirls universe is upon us. No, I am not biased. We're currently wrapping up the 3.2 build, and we hope to submit and release sometime next week (April 15th - April 19th). Robo-Fortune is the creation of Brain Drain, the psychic director of ASG Lab Zero, and stands as a testament to her maniacal creator’s unmatched pride and petulance. Built to demonstrate loyalty and cunning, Robo-Fortune fails to deliver either to any measurable degree. Employing cutting-edge technology, she sets out to hunt down the Skullgirl, and to engage in easily avoidable conflicts. Is the ASG Project’s latest creation the ultimate cybernetic soldier? Have Brain Drain’s mechanical machinations set the world on a treacherous path? Is Robo-Fortune’s faulty programming more of a feature than a bug? Has science gone too far?! Robo-Fortune is a ranged harasser and zoning character. 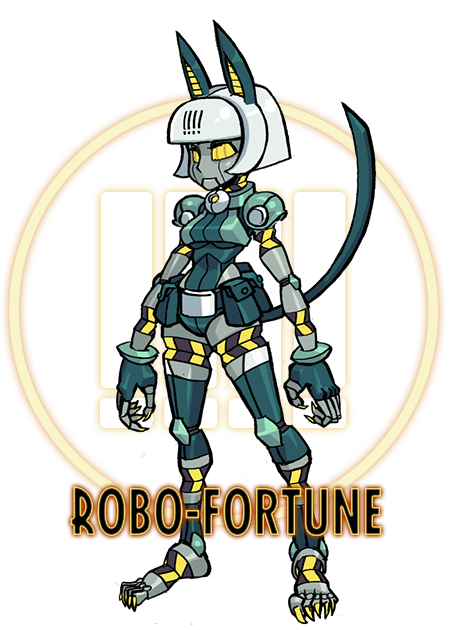 While Ms. Fortune’s strength is in closing distances and pressuring her opponents, Robo-Fortune’s strength is in keeping her opponents away from her while still maintaining her offensive potency. Her many ranged attacks allow her to sustain a barrage of projectiles while keeping a safe distance from counterattacks. While she may not be as inherently dangerous as Ms. Fortune, it's far easier for her to avoid retaliation. As far as her base stats are concerned, Robo-Fortune is purely a wildcard! Unlike all of our other playable characters, she has no true stat paradigm, and all of her stats are determined on a per variant basis. 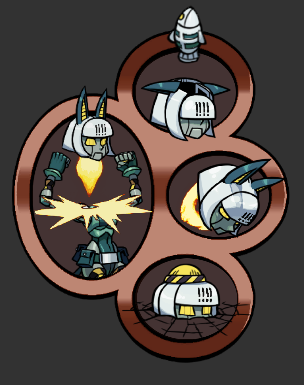 While one Robo-Fortune variant might be as tanky as a Big Band Fighter, another Robo-Fortune variant may be a glass cannon! Robo-Fortune's Character Ability, "HEADRONE HARDWARE", will summon a "HEADRONE" that floats near her until it receives a command. You can use the three smaller buttons to issue commands to your available HEADRONES, which will then carry out an action. Robo-Fortune can have a maximum of three HEADRONES summoned at a time. HEADRONE LAUNCH - Robo-Fortune will crouch down and spawn a new HEADRONE. SALVO - Command ALL available HEADRONES to launch homing missiles at the opponent. The more HEADRONES that are used in this command, the more powerful the homing capabilities of the missiles! RAM - Command one HEADRONE to launch forward towards the opponent. When it connects with something, it will explode. MINE - Command one HEADRONE to plant itself in the ground to become a proximity bomb. It will stay in the ground for a lengthy period of time before exploding on its own. If an enemy gets near, it will automatically explode. Eight new Robo-Fortune variants will be yours for the taking when 3.2 releases! You can speculate about each of their Signature Abilities by viewing their gameplay videos on our social media! HOW DO I GET ROBO-FORTUNE? As we talked about previously in our "Upcoming Robo-Fortune Release Details" thread, Robo-Fortune's launch will be different compared to our previous character launches. Robo-Fortune Relics WILL NOT be made available for purchase in the Relic store when 3.2 launches (just like we did with Ms. Fortune's launch). Robo-Fortune WILL be available in “Standard” Relics (Premiere, Bronze/Silver/Gold/Diamond, Jackpot, etc) with INCREASED ODDS of pulling Robo-Fortune instead of other Characters. Robo-Fortune’s Prize Fight and Relics WILL NOT be scheduled until 3.3 launches. Robo-Fortune’s Daily Events WILL be available when 3.2 launches. Just a reminder, all Relics obtained BEFORE 3.2 launches WILL have a chance to contain Robo-Fortune! Relic contents are decided at the time of opening. Keep an eye out for any Relics that have the "2X ODDS" sticker for Robo-Fortune on them! All Relics that have increased odds of containing a Robo-Fortune variant will be clearly labelled. If you get your hands on a RANDOM ACCESS RELIC, that's the fastest way to get your first Robo-Fortune variant. For more information about our character launch changes, check out this thread! 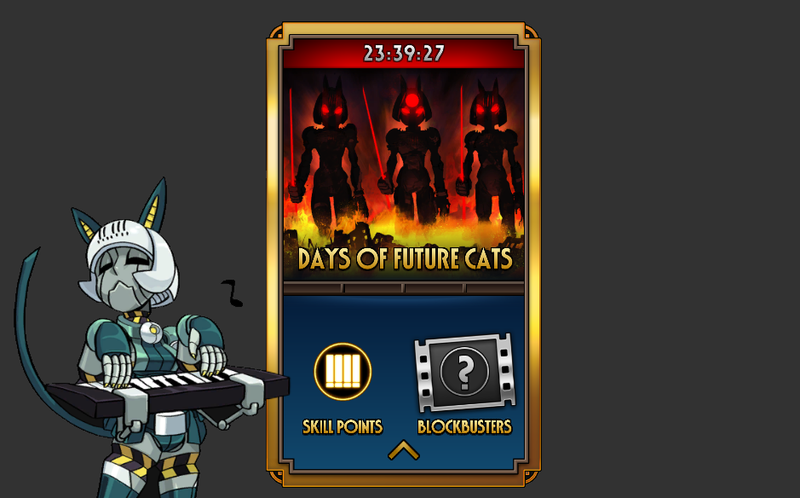 Robo-Fortune's Daily Event, DAYS OF FUTURE CATS, will be available every TUESDAY after 3.2 is released. This is a great place to pick up MOVES for your new Robo-Fortune variants! Robo-Fortune's Prize Fight will NOT available in 3.2. This event will be available after 3.3 launches. When this Prize Fight is available, her Relic will also be available in the Relic store! 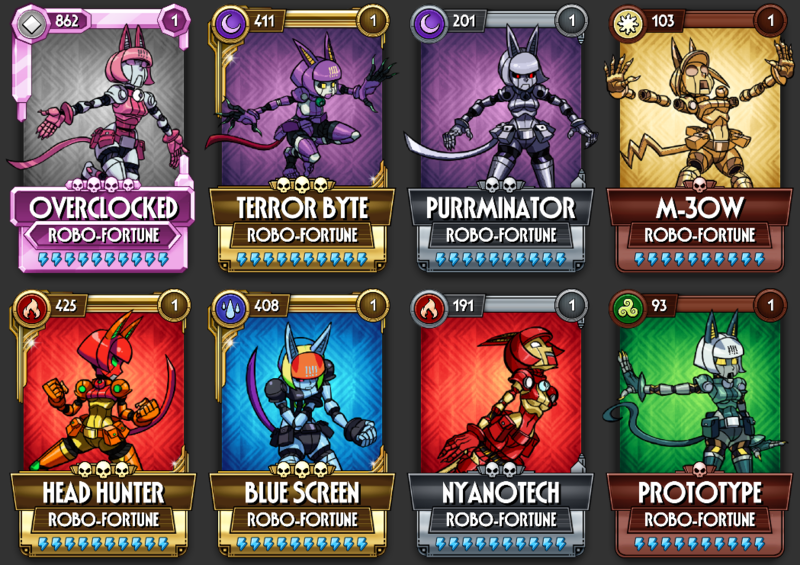 A number of Robo-Fortune's MOVES, and SIGNATURE ABILITIES will feature brand new modifiers. When a Fighter inflicted with Power Surge activates a Blockbuster, they will take damage equal to 5% of their maximum health for each stack of Power Surge applied on them. Bait the opponent into using Blockbusters after they have Power Surge to do some serious damage! If you're inflicted with Power Surge yourself, make sure you have enough health to survive using a Blockbuster! Inverse Polarity will reverse all effects of healing. This Modifier is an extremely powerful counter to specific Variants and match Modifiers. It can also be used to block "revive" Signature Abilities! When a Fighter has Barrier, they will gain a shield that absorbs damage equivalent to 10% of their maximum health. This stacks up to 5 times, for a total of 50% life! Barrier blocks damage from ALL sources, including bleed, health removal, physical hits, throws, and more. The Meridian Area Rapid Transit is open for passengers! 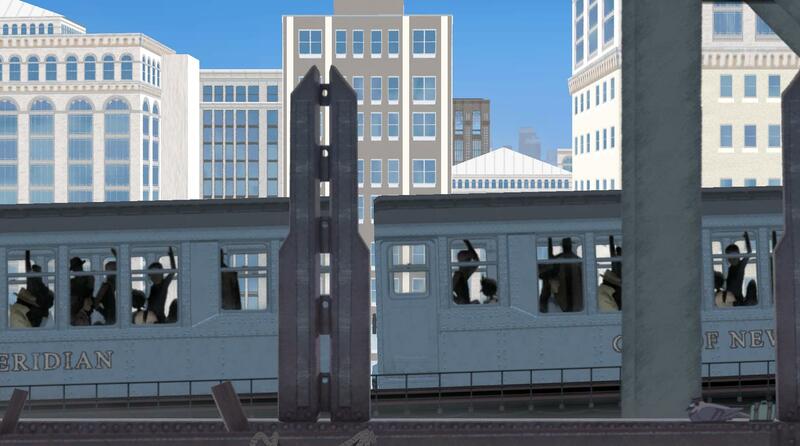 This action packed ride will take you on a tour through the whole city with time to spare. You can find this stage in Robo-Fortune's Daily Event, and any "random stage" fights. Catalysts are making their way into Skullgirls in 3.2! 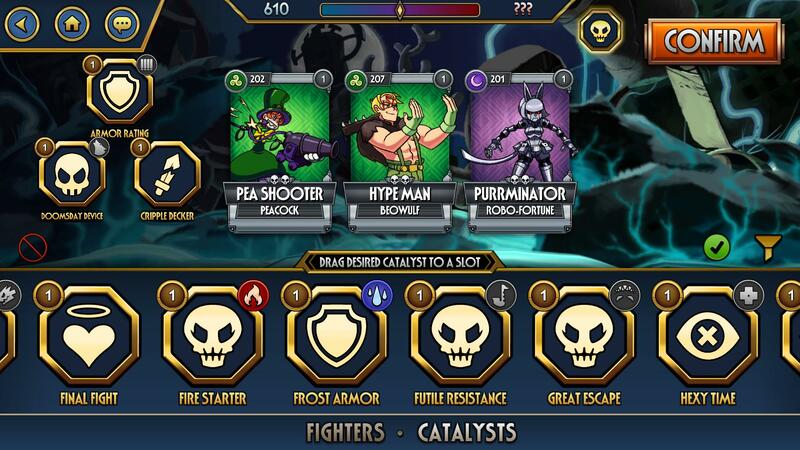 Catalysts are collectibles you can use to customize the modifiers on your Rift Battle defense nodes. Catalysts are not consumable, and can be reused in different configurations. With Catalysts, you decide the best way to add a twist on your defense to keep things challenging for your opponent. Catalysts can be earned through the Catalyst Relic, which is a new Relic available in the Relic Store at all times. They can also be earned through Catalyst related offers! Catalysts can also be purchased from the Cabinet of Curiosities' TREASURES tab. Once you acquire a Catalyst, you can upgrade it using Canopy Coins, similar to Moves. If you have a Catalyst you don't need, you can sell it for Canopy Coins! STANDARD CATALYSTS - A version of a standard Catalyst that affects ALL defenders on a node. STANDARD FIGHTER LOCKED CATALYSTS - A version that ONLY triggers when defenders of a specific Fighter type (Double, Filia, Squigly, etc) on a node are active, with increased potency. Unique Elemental Catalysts - Only triggers when a Defender of a specific element is active with a powerful Modifier. Unique Character Catalysts - Every Character type has their own unique Catalyst that can ONLY be triggered by an active Defender of that Character type. As such, Catalyst synergy with your defenders is just as important as your standard defense team synergy. You can even pool Fighters of the same type and Element together for maximum efficiency. To make room for the addition of Catalysts, the Rift Battle defense map has been tuned. More on that in our next section! We're making some other adjustments to Rift Battles beyond the addition of Catalysts, here are the changes! The Rift Battle map modifiers have been tuned so that the addition of Catalysts doesn't make things unreasonably difficult. Open the spoiler tag for a full rundown on all of the changes! REMOVED - ATK and HP modifiers. ADDED - One Catalyst slot. ADJUSTED - ATK and HP modifiers reduced to +50%, down from +100%. ADDED - Two Catalyst slots. ADJUSTED - ATK and HP modifiers reduced to +100%, down from +150%. ADDED - Three Catalyst slots. Instead of starting the match with permanent IMMUNE, the IMMUNE now triggers when the defender drops below 50% HEALTH. When this happens, all debuffs are REMOVED as the IMMUNE is applied. Previously, Rift Rating was the only metric used to match two players together. In 3.2, your collection strength will now be factored into the matchmaking algorithm. You shouldn't be matched with anyone that has a wildly different collection strength than your own. Battles should be at least competitive, and you can hopefully clear most or all of your opponent's base for Rift Coins even if you're the underdog. You may sometimes match with players way outside of your Rift Rating. This is because the matchmaker found your collections to be competitive, so there's no reason to be alarmed. These types of matches should be less common as time progresses. As a result, you may end up waiting a little bit longer for a fair match. We'll be keeping a close eye on this. Long overdue, but in the spirit of making our combat more reliable and consistent, almost every attack in the game has been tuned in some way (big or small) in this update. These changes are a little bit complex, but I'll do my best to break them down below! Previously, most attacks made the attacker available to be punished if they stopped attacking, even if the attacker HIT the defender. In 3.2, you can start blocking after any attack that hits the opponent, and you won't be punished. This should lead to fewer instances of the AI using a Blockbuster in the middle of your combo should you fail to tap fast enough, since hitstun has been increased on most attacks. Every character can now perform TWO safe on block "tap attacks" with or without advanced combo upgraded on the skill tree. This means that if you attack the opponent with one tap, then tap again, and see that they are blocking, it is safe to start holding the block input - you can't be punished! The final hit of a tap attack sequence can still be easily punished on block. As a general rule, stop attacking as soon as you notice the opponent is blocking, and you're safe from being punished. If you continue attacking, you will be punished. Extra tap attacks inserted due to the advanced combo being unlocked are tuned on a case by case basis. As a general rule, if it comes after a characters "natural" second tap attack (with no advanced combo unlocked) it is likely not safe on block. If it becomes before their natural second tap attack, it's safe on block. All Dash Attacks are now SAFE on BLOCK. You can safely approach your opponent and be aggressive without being punished. A blockstring is a string of attacks that cannot be interrupted if the opponent is blocking, because there is no gap in between each of the blocked hits. In 3.2, all characters can perform a dash attack, followed by their entire ground combo chain, without leaving a gap for the opponent to activate an attack such as a Blockbuster, normal, or Special Move. You can safely perform attacks into the opponents blocks without being interrupted, but you may be punished if the attack you finish with is not safe on block! A huge pass has been made on almost every Blockbuster in the game to clean up their "invincibility" rules. Example here! All Blockbusters can now be interrupted by STUN and DEATH at any time, except for THROW BLOCKBUSTERS and BB3s. Almost every Blockbuster can now be interrupted shortly after the first attack begins. EX: If your opponent is using a Blockbuster from fullscreen away charging towards you, they can be stopped by punches, projectiles, etc, assuming your timing is on point! Every Blockbuster is invincible until the "action" or "attack" begins. This means that Blockbusters which previously were not invincible should now be effective reversals. 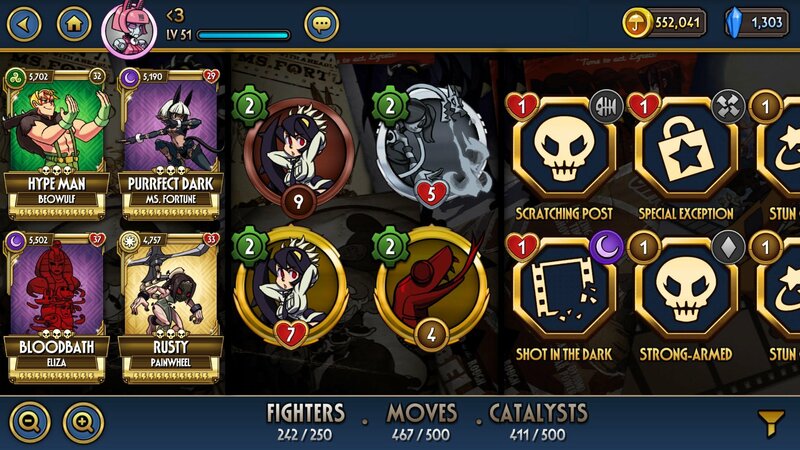 With these changes, Skullgirls Mobile should feel even closer to a traditional fighting game. If you have questions about these changes, please don't be shy about pinging me here! (@Liam) I'm happy to explain these changes in more detail where possible. While we were tuning every character, we made a few special exceptions and additional changes that are worth mentioning. BB1 Super Sonic Jazz - Now has proper unflinching during the charge, not invincibility. He can die while moving forward! BB1 Beat Extend - Previously this move had no start-up due to a bug. It now has 5F start up, up from 0F. This change is the same one we made Diamonds are Forever, and Counter Venom. BB2 Bandwagon Rushdown - This is one of the few remaining non-BB3 Blockbusters that cannot be interrupted by STUN, but this is only true for the car portion. BB1 Napalm Shower - Because this move doesn't have any attack or hitbox, it is completely invincible until the animation is over. It cannot be punished. BB2 Lonesome Lenny & BB1 Shadow Of Impending Doom - Because these moves do not have any immediate attack or hitbox, these Blockbusters are completely invincible and cannot be truly punished. BB - Drag N Drop - No longer invincible after it is blocked. More of a bug fix! This can be punished now. Final Tap Attack - Lowered pushback on this move and increased recovery so that she can be more easily punished. Final Tap Attack - Lowered pushback on this move and reduced blockstun so that she can be more easily punished. In 3.2, you can now FAVORITE your Fighters, Moves, and Catalysts to prevent them from being SOLD or SACRIFICED! When you ping me on Discord asking me to restore a move you accidentally sold, I'm going to be extremely disappointed now!!! You can also sort your collection by FAVORITES to speed up team and Rift Base building! Stay tuned for more quality of life changes like this in the near future. Numerous offers have had their Canopy Coin rewards DOUBLED (with no increase in price). All "Fighter Variety Pack" offers now contain Robo-Fortune Relics at no extra cost. We've added 3x Diamond Keys to the Weekly Royal Renoir Pack! Many more surprises in store - keep an eye out! To make room for Catalysts, the loot tables for the TREASURES section of Cabinet of Curiosities has been adjusted. Most notably, MOVES can no longer be acquired in the TREASURES section. Two new features have been added to the Options menu! When enabled, most flashing during a fight will be completely disabled. This includes the flash that appears when a character dies, and the flash that appears immediately before and after the "SHOWTIME" intro animation. The "SHOWTIME" intro animation also has several bright background elements removed when this setting is enabled. When disabled (that's the default!) the game will now aim to run at max FPS for better performance. If your device is capable of hitting 60 FPS, you can do that now! Note that this drains battery even faster than before, so you can enable this 30 FPS limit to save battery when needed. Adjusted how character data is loaded to further lower memory usage. Tons of optimizations have been made to almost all UI screens. Restored AI "Charge Attack" defense logic, which wasn't working as intended in 3.1. Added extra logic to help prevent possible loops with Charge Attacks in more situations. More logic was added to prevent the AI from using a BB3 when their enemy is dead. Should hopefully prevent getting BB3'd before you have a chance to act or defend yourself! That's All Folks' will no longer display "SLAPSTICK" SA text every time she is hit. Hellcat's ENRAGE will now only activate when the match begins. Fixed an issue where Parasoul's SM - Burst, didn't knock the opponent down after 3.1.2. Fixed an issue where Parasoul's BB - Canopy Bounce, wasn't a true combo after 3.1.2. Fixed an issue where Big Band's hurtboxes during his STUN animation were deceptively small. Squigly's BB3 - Rage of the Dragon, now counts as 120 individual hits instead of one single hit. When Squigly is Player 2, she will no longer always appear right on top of her opponent when she tags in. She now respects the position of the tombstone. Yes - this tag in just got a lot easier to handle. Last Hope will now display "Urgent Care" SA text when her revival SA activates. 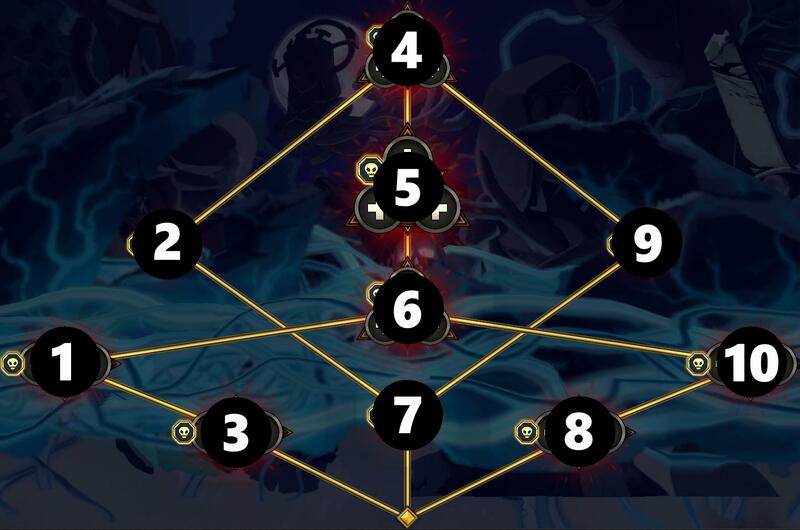 The final hit of Eliza's BB - Keprhi Sun, will now always connect against the opponent even if you have already hit the opponent OTG (Off The Ground) in that combo. Fixed an issue where Painwheel's air throw from CA - Flight Risk, would erroneously activate Modifiers which looked for Tag Ins, such as CAST PARTY and INERTIA. Fixed an issue where the Fighter Score of a node wasn't displaying the boosted value from HP and ATK modifiers in some scenarios. Skill Points from Accursed Experiments for all characters increased to 25, up from 10. Added a 10% chance for the treasure node in Accursed Experiments to drop a Diamond Key. Fixed an issue where titles of Blockbusters and Special Moves were swapped on some screens. Fixed an issue where the slow motion effect wasn't playing when the last Fighter died. All characters are no longer "invincible" during their Air Juggles. You can be knocked out of your Air Juggle by BB Inferno of Leviathan, STUN, DEATH, Robo's new "SALVO" missiles attack, etc. Added a safeguard to protect players from experiencing soft locks on the frame a throw connects with the opponent in EXTREMELY rare situations. If this occurs in the future, the game will no longer soft lock, but other bugs may surface! Fixed a bug where some hit sound effects could stop playing. Fixed a bug where a weird black circle would appear on the "Blockbuster Death" background effect. Fixed an issue where characters could tag out to themselves (!!!) in rare situations. Fixed an issue where characters could take damage while they had INVINCIBLE in some rare scenarios. Numerous changes were made to FINAL STAND to make it more reliable at preventing death. Fixed an issue where some modifiers could become permanent when Double - Sundae School, was present. Fixed an exploit where players could create line breaks in chat. Now displays a message when a player fully upgrades a Catalyst. Improved stability and added more logic to help detect corrupted download data so that repair attempts can be made. Added error codes to several connection error pop ups that were missing them. Fixed an issue where currency counters (Theonite / Canopy Coins) sometimes wouldn't update when making a purchase in the Cabinet of Curiosities. Implemented fixes to help safe guard against a rare scenario where a players Rift Rank in the lobby would be different than what was mentioned in the Rift Battle season end mail. Fixed an issue where the "Queued Glow" on circle Character Ability buttons was twice as big as it should be. A huge pass was made at our recent implementation of Chinese Localization after feedback from the community. Thanks to those who shared large threads breaking down issues they found! We'll continue to share localization feedback with our partners as we see it. We're extremely excited for 3.2, and we can't wait to share it with you! We'll keep you all updated on the release status, and we'll do everything we can to get the newest version in your hands ASAP. Thoughts? Questions? Feedback? Let us know down below and we'll do our best to answer any lingering questions! HarveyG, TraiP, rexturtle1120 and 23 others like this. Ryouhi and Liam like this. Exiciting! Very happy with the changes and also very hyped for Robo! Woop Woop! Also does this mean Untouchable won't be able to luck her way out of a full RotD anymore? What Day will be available that long-awaited update? we hope to submit and release sometime next week (April 15th - April 19th). This update gonna be hype. At long last, the coolest and most awesome Skullgirls character in the entire Skullgirls universe is upon us. No, I am no biased. BallotBoxer, cappatacus, Boombustero and 6 others like this. I sent a response in your last thread awhile ago mentioning that this wasn't a bug, and that we lowered the quality of voice lines to reduce memory usage. We did reduce the quality of voice lines specifically in 3.1 to help reduce memory overhead, but it should hopefully not be very noticeable on device speakers. Or is it supposed to work as the first formula? Thanks for your support. Is cerebella's brain freeze variant gaining health from negative damage from special moves thanks to her SA going to be fixed? Also, does the change on Rage of the Dragon means that Brain Freeze will take 0 damage from it? Damn, that's a lotta content! I'm okay with this. The double Robo-chance will be nice for people that have saved up Theonite or relics and hopefully this pays off financially for you guys. The only shame is that it's gonna be hard to get a Robo relic, which is a shame cause it's so damn cute! Power Surge, similar to how Assassin's Greed works may be hard to safely bait the enemy into using a blockbuster. Wonder how long the debuff is going to be, so your window of baiting them is long enough. Yay! New stages are always great and this one looks like one hell of a ride! I wouldn't have thought this was going to be a very mobile hardware-friendly stage, since there's alot of moving parts to be rendered. Curious to see it in action. I was cautious when these guys were first announced, but as long as they're not overly powerful or there's too many Meta-catalysts, this seems like fun. I am a bit concerned what they will do to the average Rift Battle length, since you will have to spend more time reading each modifier and come up with a proper strategy before getting to fight. It already took me consistently 30 minutes per rift battle, so this may end up increasing my time spent on rifts considerably. I am a little worried about the removal and nerfs of all the HP/ATK-modifiers... The early nodes were already very easy overall since they didn't have any stat modifiers. Now of course we'll first have to see how much of a difference the catalysts make for balance, so i'll withold judgement until then. Good stuff - collection strength is something i've been advocating for. This should mean battles being more competetive even between different tiers. One question @Liam - This does mean it also counts your collection of fighters you may not have used in your rift base right? So you can't cheese the system by just using worse fighters in your base to fight lower level players? This should make managing your collection and new moves you get so much easier. I'll favorite all of my good moves and sell all the rest - so when i have new unfavorited moves i'll immediately know which is new and needs to be checked. Buying moves with rift coins was a nice alternative to the rather expensive 80k per pop on the other tab. Oh well. Ce la vie. 60 FPS?? Damn! I hope my phone is powerful enough for those silky smooth animations to run at 60 fps. This is a really good indicator that shows how much more optimized the game has become since it's initial release! Hats off to you guys! More SP! Nice! Also finally more ways to gain Diamond Keys, albeit be it very rarely. Same as the favorite system, this is gonna make managing your collection so much nice. Blessed be HVS. McStrikerKick and educavalcantee like this. She already did. Before it would count to 119 combo hits doing no damage and then apply all the damage at the last hit. So BF already didn't get damaged by this ability. This time you'll at least do some damage, but it will very quickly drop off still, so you probably shouldn't use it against her still. Maybe add an optional download for higher quality assets in the options menu for people with stronger devices? Of course that would mean extra programming and what not, but could be an option? The update is really coming out before I move. What a nice coincidence. My work is putting an ever increasing strain on my eyes to the point I had to delet the app to keep myself away from playing(I’m addicted), because the flash literally hurts. But that’s all fixed now! There is no fix for nekhbet breaker not triggering Stand Out SA? you can't cheese the system by just using worse fighters in your base to fight lower level players? The current implementation we have planned won't make this viable. Yeah. Optional downloads is a lot of work for such a small thing. Pretty off the cuff, but when we look into alternate voices and announcers, we may need a system like this which may line up with such a feature. I am a little worried about the removal and nerfs of all the HP/ATK-modifiers... The early nodes were already very easy overall since they didn't have any stat modifiers. Yeah, we'll definitely be keeping a close eye on this! If a bug fix isn't listed, it won't be included in this update. I noticed this as well. I'm not a big fan of it and I'd love for them to all be as consistent and reliable as Parasoul's Canopy Bounce... so, hopefully some day soon! We may look into damage formulas again, but at the moment it's working as designed. Luka Kitsune, lothorie, Jaz00 and 1 other person like this.